Sisko was also forced to deal with internal pressures within the Federation as well. When the Federation-Cardassian Treaty of 2370 caused several colonies in Federation space to come under Cardassian rule, many colonists felt the Federation had abandoned them. They formed the Maquis, a terrorist group operating out of the Badlands. Sisko's old friend Calvin Hudson was assigned as the Starfleet attaché to the colonists in the Demilitarized Zone but became a Maquis leader. S everal other Starfleet officers resigned to take up the Maquis cause. Sisko felt angered by the actions of these officers, and felt the pain of personal betrayal by Cal Hudson. In late 2370, Sisko made first contact with the Dominion in an encounter with the Jem'Hadar. This launched Sisko on a path that would define his career. The Dominion declared the Gamma Quadrant off-limits to Alpha Quadrant species, and destroyed several Starfleet ships, along with the colony on New Bajor. Sisko returned to DS9 with the realization that he had discovered a powerful and dangerous new enemy. Sisko returned to Earth to brief Starfleet on the Dominion situation. Realizing that Deep Space 9 was to be the first line of defense from a Dominion attack, Sisko convinced Starfleet Command to finish work on the mothballed USS Defiant. Sisko returned to DS9 with the new warship, and entered the Gamma Quadrant on a mission to find the Founders. During the mission, the Defiant and crew were captured by the Jem'Hadar and placed in a simulation, testing their reaction to a Dominion incursion in the Alpha Quadrant. It was discovered that the Founders were in fact Changelings, the same species as Sisko's security chief, Odo. Odo forced the Founders to release the Defiant crew, and they returned to the station. In 2371, Sisko was confronted by Vedek Yarka, who told him that he had discovered a prophecy in which the Emissary was involved in the destruction of the Celestial Temple. After reviewing Trakor's Third Prophecy, Sisko ignored the Vedek's warnings. He continued work on a subspace communications relay through the wormhole into the Gamma Quadrant. However, Major Kira Nerys was slowly convinced that Yarka was correct. She interpreted the prophecy as referring to three Cardassian scientists aboard the station, and a comet which was discovered near the wormhole. The comet was on a course leading it into the wormhole, causing it to collapse. Sisko stopped the comet, but inadvertently released trace amounts of silithium, which caused the wormhole to constantly remain slightly open. In the end, this chain of events actually fulfilled Trakor's prophecy, without the destruction of the wormhole as the final outcome. Sisko began to take an interest in other Bajoran prophecies, but continued his skepticism about his role as the Emissary. 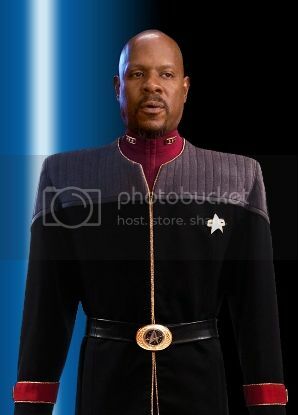 Following three years of commanding Deep Space 9, Sisko was given a promotion, finally attaining the rank of captain in late 2371. Soon afterward, Sisko discovered that the Founders had begun infiltrating the Federation, posing as high-ranking officers. One Founder, disguised as an ambassador, ordered Sisko on a mission to the Tzenkethi border, and then tried to provoke a new Tzenkethi war. Sisko and crew were successful in stopping the Founder's attempt, but it became apparent that there were now Changeling infiltrators in the Alpha Quadrant. Fears of Dominion infiltration swept the quadrant, and when the Cardassian government was overthrown by the civilian Detapa Council in 2372, the Klingon Empire feared Changeling intervention. A large Klingon task force docked at Deep Space 9, bound for Cardassian space. Klingon Chancellor Gowron asked Sisko for Starfleet's help in invading Cardassia Prime. Sisko rejected their call for help, and the Klingons withdrew from the Khitomer Accords, ending decades of peace. S isko now had to ally himself against the Klingons and help the new Cardassian government survive the Klingon attack. He contacted his long-time adversary, Gul Dukat, and arranged to rescue him and the new Council. He made sure, however, to test the members for possible Changeling impostors. Faced with a war on two sides, the Klingons backed down. However, the balance of power in the Alpha Quadrant was changing, and this played right into the Dominion's hands. On Earth, video footage linked the bombing of the Antwerp Conference to Changeling infiltration. Sisko's knowledge of the Founders led to his brief promotion to Chief of Starfleet Security on Earth. Using Odo as a test subject, Sisko implemented many new security measures on Earth such as automated low-level phaser sweeps throughout Starfleet Headquarters. Unfortunately, his promotion was part of Sisko's former captain, Admiral Leyton's, plan to overthrow the Federation government. Leyton misjudged Sisko's loyalties, and the coup d'état failed when Sisko and Odo exposed the plan. Sisko continued walking the fine line between acknowledging the Bajoran beliefs and rejecting their admiration for him. In 2372, an ancient Bajoran lightship emerged from the wormhole carrying famed poet Akorem Laan. Akorem had apparently discovered the wormhole centuries before, and had been inside it ever since. Finally able to relinquish his title, Sisko jumped at the chance to allow the poet to become the Emissary. However, when Akorem began guiding Bajor down a road incompatible with joining the Federation, Sisko decided to challenge his title. He began studying the ancient texts, and realized that many of the prophecies applied to him, and not to Akorem. The two men traveled back into the wormhole and met with the Prophets, who confirmed that Sisko was in fact intended to be the Emissary. They returned Akorem to his own time, altering the timeline, but somehow preserving everyone's memory of the previous events. Following this, Sisko slowly began to embrace his role as the Emissary. Changelings also infiltrated a high position within the Klingon Empire. In 2373, Sisko and crew were ordered to expose the impostor. Undergoing cosmetic alterations to appear Klingon and taking the Klingon name Jodmos, son of Kobor, Sisko took three crewmembers to the Klingon outpost Ty'Gokor to expose Chancellor Gowron (whom the Founders had led Odo to believe was a Founder). It was later discovered that General Martok was the Changeling. The mission was a success, and it brought the two powers closer to reconciliation. During a trip to the Gamma Quadrant that same year, Sisko took possession of a Jem'Hadar attack ship and returned the ship to Starfleet Intelligence. In mid-2373, Sisko experienced a series of pagh'tem'fars in which the location of the lost city of B'hala was revealed to him. He was also shown the destruction of Bajor after its entrance into the Federation. Following his visions, he recommended that Bajor not join the Federation at that time, which angered Starfleet Command. Sisko was forced to undergo surgery to stop the visions when they became life-threatening. Soon afterward, the Dominion formed an alliance with the Cardassian Union, gaining a foothold in the Alpha Quadrant. They attempted to destroy Deep Space 9 and Bajor and cripple the Klingon and Federation fleets in one action, but Sisko discovered their plan and thwarted it. This new turn of events convinced the Klingon government to reinstate the Khitomer Accords, and Sisko allowed a permanent Klingon presence on the station. However, with the new Dominion presence in the Alpha Quadrant, war was inevitable. As Dominion fleets began coming through the wormhole on a weekly basis, Starfleet made the decision to mine the entrance to the wormhole. Sisko commanded the station during the resulting Battle of Deep Space 9, the opening strike of the Dominion War. During the final moments of the battle, Sisko gave a speech to the station residents, telling them of his fondness for commanding the station, promising to return. The Dominion took control of the station, but Sisko implemented a computer program which completely destroyed DS9's main computer core. Sisko retreated aboard the Defiant, leaving his prized antique baseball behind; the station's new commander, Gul Dukat, knew this was a sign from Sisko that he would eventually return. Sisko commanded the Defiant for the next three months, engaging in numerous battles with Jem'Hadar and Cardassian forces. Ordered to fall back to Starbase 375, Sisko was placed in command of a mission behind enemy lines to destroy a ketracel-white storage facility. Sisko and crew traveled aboard the stolen Jem'Hadar attack ship he had acquired a year before, and completed the mission. However, their ship was destroyed and they were stranded on a planet in Dominion space along with Jem'Hadar forces. Knowing he was beaten, the commanding Vorta, Keevan, gave Sisko his force's attack plans. Sisko was forced to massacre the Jem'Hadar troops, despite his personal objections. Sisko's crew was soon rescued by General Martok and Worf aboard the IKS Rotarran. Having completed his mission, Sisko was promoted to adjutant for Vice Admiral William Ross at Starbase 375. He was forced to give command of the Defiant to Lieutenant Commander Dax. Using his new influence in Starfleet, Sisko created a plan to retake Deep Space 9, Operation Return, and convinced Starfleet to commit its forces. After learning that the minefield around the wormhole was about to be neutralized, Sisko ordered the operation to commence immediately. He commanded the Starfleet forces during the battle from the Defiant, and made his way to DS9. Faced with an armada of Dominion ships as the minefield fell, Sisko ordered the Defiant to go down with guns blazing. In a vision from the Prophets, Sisko convinced them to destroy the invading fleet, and he returned to retake the station. Following his defeat during Operation Return, Gul Dukat descended into madness and was captured. He was forced to stand trial for his crimes. Captain Sisko was to testify at his trial, but their transport, the USS Honshu, was destroyed by Cardassian forces. They escaped in a shuttlecraft and crashed on a nearby planet. There, Dukat's madness intensified, and he attempted to kill Sisko. Vowing to kill every Bajoran, Dukat escaped as the Defiant rescued Sisko. Following the ordeal, Sisko vowed that from then on, "it's him or me." Soon afterward, Sisko hired Elim Garak to fabricate a recording designed to bring the Romulan Star Empire into the war. This plan was approved by Starfleet. Sisko struggled with the ethical implications of his actions, but in the end decided it was worth it. With the help of a few of Garak's sources, he was able to fabricate a holo-recording of the Dominion and Cardassians planning on invading Romulan space once the war was over. He secretly invited Senator Vreenak over to DS9 to "show" him the evidence. However, Vreenak later found it was a fake and was prepared to expose this "vile deception" to the entire quadrant. But a few days later, it was reported that the Senator's shuttle was destroyed. Sisko confronted Garak on what he had done, but the former Obsidian Order agent pointed out that it was the only way to make the Empire think that the Dominion was responsible, with the acceptable losses of one convict, a senator and the self-respect of one Starfleet captain. As a result, the Romulans entered the war, attacking several Cardassian outposts along the Cardassian-Romulan border, and turned the odds in the Federation's favor. Sisko later recorded what happened into his personal log before deleting it. Later that year, Sisko inadvertently instigated the prophesied Reckoning, the battle between the Prophets and the Pah-wraiths. His son was possessed by a Kosst Amojan and Major Kira was taken over by a Prophet. The outcome of the battle was indefinite due to interference by Kai Winn. Sisko was chosen to command the first offensive into Dominion space in late-2374. The First Battle of Chin'toka was a success, but while Sisko was away, Gul Dukat managed to close the Bajoran wormhole, cutting off Bajor from the Prophets. He also killed Jadzia Dax. Sisko felt responsible, and decided to take a leave of absence to find a way to restore the wormhole. Ben and Jake returned to New Orleans, not knowing if they would ever return to DS9. After three months on Earth, Sisko was given a vision of a woman's face in the sands of Tyree. He reconstructed her face on a PADD, and Jake recognized her from a photo in which she appeared with his grandfather, Joseph, who reluctantly identified her as Sarah Sisko, Ben's birth-mother. Joseph finally told his son about his true mother, prompting Benjamin to travel to Tyree to find the meaning of his vision. He departed along with his father, Jake, and Ezri Dax, the new Dax host. While on Tyree, Sisko discovered the Orb of the Emissary, which restored the Bajoran wormhole. He also communicated with the Prophet who had possessed his mother, and learned of her true identity. Following the reopening of the wormhole, the tide of the war turned back to the Federation's favor, and Sisko returned to the station. Later that year, Sisko commanded the Defiant in the Second Battle of Chin'toka. The ship was destroyed by the Dominion's new allies, the Breen Confederacy. Sisko was then given command of the USS São Paulo, in late 2375, which was renamed to USS Defiant. Sisko then helped command the final assault into Dominion territory. The Battle of Cardassia was a success, with the help of the Cardassian Rebellion. Afterward, Sisko, Admiral Ross, and Chancellor Martok gathered in the ruins of Cardassia to celebrate. Faced with the destruction the Dominion had wrought in retaliation for the Cardassian uprising, Sisko did not feel like celebrating. He returned to the station to bid farewell to his crew before their reassignment. Sisko was led to the Bajoran Fire Caves following the victory at the Battle of Cardassia, where he engaged in a final showdown with the Pah-wraiths, in the form of Dukat. Sisko destroyed the evil Book of the Kosst Amojan and trapped Dukat, along with the Pah-wraiths, in the Fire Caves forever. He was taken to the Celestial Temple, where his work had only begun. In the linear timeline, while still residing with the Prophets, in April of 2376, Sisko appeared to Kira Nerys in a dream and to Elias Vaughn in an orb experience. Later Sisko encountered Elias Vaughn, who was having another orb experience courtesy of the Orb of Unity. Sisko and Vaughn helped each other return to linear existence in time to save Bajor from the threat of the alien Parasites infecting Bajor. Sisko returned just in time for the birth of his daughter, Rebecca Jae Sisko, called the Avatar of Peace in the ancient writings of the Bajoran heretic Ohalu. After his return, Sisko turned down a promotion to Admiral, and enjoyed an extended leave of absence from Starfleet. Sisko later spent time with his wife and daughter in his home on Bajor preparing for the return to Bajoran space of the mysterious Ascendants. Sisko returned to DS9 in early 2377, following the brutal attack on Captain Kira by the Jem'Hadar observer, Taran'atar. He stayed with Kira, and upon her emergence from a coma broke the news that Bashir had been forced to replace her heart. Sisko, an avid baseball fan, attended opening day for the Pike City Pioneers of the Cestus Baseball League on Cestus III in 2378. There, he met then-governor, future Federation President, Nanietta Bacco. In 2379, Sisko briefly worked at the excavation site at B'hala. Later that year he accepted Admiral Janeway's offer to return to Starfleet so long as he could work from Bajor as much as possible.